This Way Up is the first foundation paper pieced quilt I've finished this year, and I'm really happy with it. The original pattern is called Woodcut, but I named my quilt This Way Up because all I can see are arrows pointing up! I almost considered leaving the colored spaces unquilted to make them pop, but that's really not my style. So instead, I opted for some simple geometric lines with echoes. In all the little nooks and crannies around the colored spaces, I didn't have a lot of room, so I did what works best for small tight areas ... pebbles! It really mashed the area down, and helped to enhance the colored arrows with the contrast in quilting density. My favorite part of every quilt to quilt is almost always the negative space. In this quilt, there really wasn't a lot of it. I did some stacking swirls that looked like they were growing out of the pebbles, and added some straight lines in the border area for some contrast. I still occasionally overthink my quilting design, but in general it's been getting much easier for me to land a concept and go with it, because I realize it just has to look good, it doesn't have to be the most-amazing-design-ever. And finished is better than perfect, anyway! Linking up with: Busy Hands Quilts, Crazy Mom Quilts, Sew Can She, and Cooking Up Quilts. This is absolutely gorgeous! I love the different quilting motifs you've used -- they work well together to accent the quilt! Beautiful quilt! I love the colours and how the contrast between the straight line and swirly quilting brings out the arrows. What a gorgeous quilt! I love the colors you chose and the quilting is awesome. I beginning to think you have super, magical long arm quilting powers. The quilting is just gorgeous and am still amazed that it's only been several months since you got your long arm. This quilt is going to be a nice addition to your gallery. Beautiful quilting. I love the color palette, it just pops (although I'm sure that awesome quilting helped too :) ). Such a lovely quilt - and your quilting style is amazing. Congratulations on such a gorgeous finish. Fantastic quilt. beautiful colors and great pattern. Love all the quilting designs you chose! The pebbles are perfect for that tight space. Beautiful, fun colors, too! Great job finishing another beauty!!! Wow, just wow! All those pebbles....they are great! 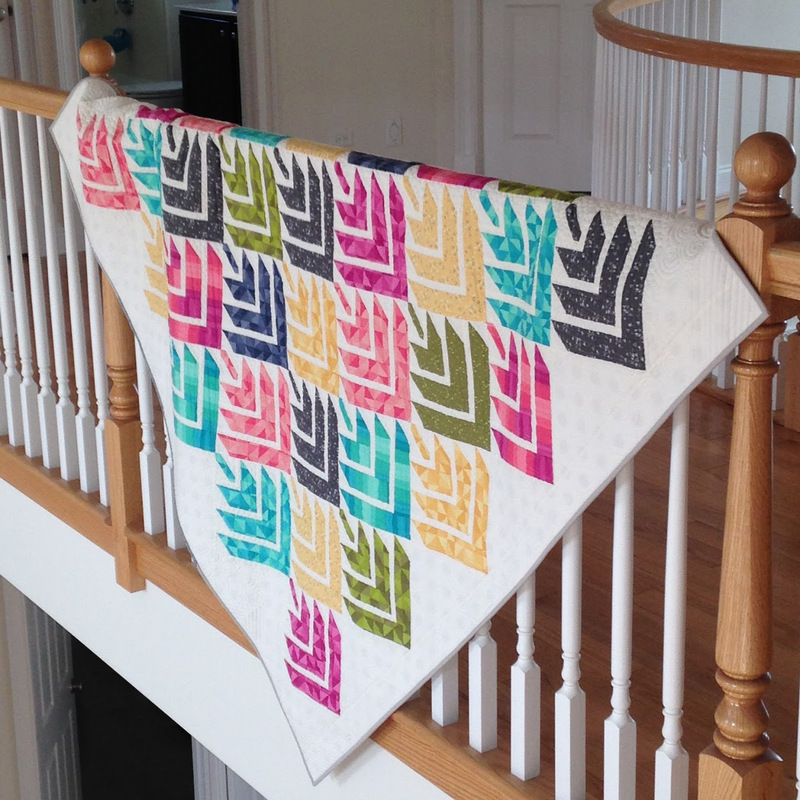 Hi Joy, your quilt is awesome and the FMQ really adds to it!